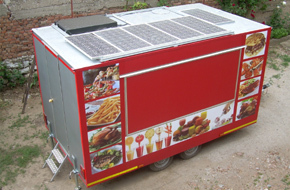 Company "Vidija" was established in 1989 in Niš and is engaged in manufacturing movable fast food stands with built-in kitchen and solar charge thru roof panels. It is state-of-the-art Serbian product according to European standards. Movable kiosk-trade store has ten square meters of usable space, is made of stainless steel for food industry, has "green" charge, i.e. thru panels across roof, turning solar energy into electrical providing sufficient voltage for refrigerator, cooling chamber with small power consumption motor, illumination can operate up to three days without sun, unique in the world! This product is not manufactured by anyone in Serbia; this unique movable shop was designed, manufactured and built by domicile people, predominantly from Niš. Project is based on domestic know-how and material which makes price of this product very competitive in the world market. Our movable shops are two times cheaper than German, for instance. Trailer has 2 axes and impact driving shaft which makes it safe with even load; more importantly it is easy to toll, 4 cm thick panels are cast with perforated sheet. Panels are custom-made blocks, which makes them strong and reliable. Panels are made with plastified 0.6 mm sheet outside, whereas internal surfaces are made of 0.6 mm inox-stainless acid-resistant steel. Auto installation is laid out according to EU standards with a hose along the whole way additionally coated with polyurethane foam according to the Safety Law. Power solar panels on the roof, power of 80w each, 6 of them making it total of 480w that charge the batteries. Power solar panels charge the batteries thru their 12/230 V converters generating power voltage 1.5kw and can last without the Sun at least 24h if refrigerators are opened constantly, and if opened when necessary even more. Solar devices and converters are constructed according to needs and requests of the buyer. Equipment for movable shop-kebab stand or store for other purposes is custom-made. Trailer has standard equipment: clean 30-50 or 100 liter water tank as well as waste water tank. Trailer floor, i.e. walking surface is made of 3/4 mm rubbed aliminium plate under which on the entire trailer surface is a chasis filled with anti-inflamatory polyurethan which makes it comfortable and insulated from cold and warmth. Electrical installation of alternating current is laid thru the hose and panel additionally secured by casting. Trailer illumination is made with economic LED bulbs. All devices, such as refrigerator and showercases, deep-fryer, gas stove, etc. are made with the state-of-the-art inox technology. Big energy consumers (sucvh as grill, gyros, pancake stand, chicken convectomat grill) are made to conform buyer´s demands for renewable energy, such as natural gas and easily replaceable gas tanks. Why using gas and not current? 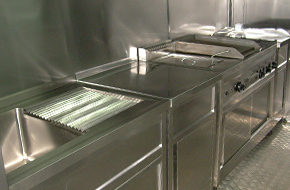 Buyer´s requests include need to prepare food in the shortest possible period, because essentially trailer is used as a movable fast food premise. 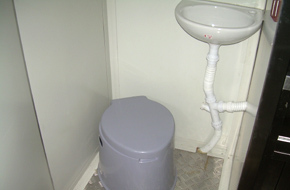 Under the Serbian standard WC is mandatory for personnel, and is constructed in room of sufficient size, including chemical wc as well as water for washing hands and to be easily maintained. What do we have to offer (is not included in the images)? Gyros, convectomat or so-called blower, chicken grill, beer taproom, fruit squeezing apparatus, various illumination, LED ribbons, roof opening advertisements. Auto graphic is custom-made with logo and message. All devices are made of inox, gas stove and grill have hardtop hood with filters which makes in ecologically green. Trailer is easy to toll and park because a chasis is well-balanced and made of the highest quality material; shafts are with torsional and inertion brake on all 4 wheels. Trailer signalization is made according to all EU standards. It takes up to 3 minutes from parking until beginning of food preparation. It is very easy to park. It has all required documents and is made by HACCP standards. Company Vidija has international WMI number which is, with invoice and technical inspection, sufficient for registration. We are proud of assignment of international WMI number which is essentially guarantee of trust and successfullness of the project. Trailer is of top European quality and meets all European standards. Trailer can be bought with a bank loan. Price is per agreement and it depends on installed devices (depending on buyers needs). Product delivery is 20 to 30 days.